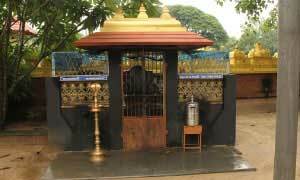 The present Head of the family and the Chief Priest of Kanadi Kavu, blessed by Vishnumaaya and the Lord of Thriprayar, is Brahmasree VishnubharatheeyaSwami. Swami has been carrying on the duty of performing all the poojas at the Kanadi Kavu, with devotion, without any compromise, strictly according to tradition and thereby giving satisfaction to the thousands of devotees who come there every day to find a solutions to their problems. Five decades ago, the then Chief of the temple Sree Krishnaswami, a very observant person, saw the radiance of a Yogi, just awakened from meditation, on the face of the little boy. Then through education, deep thinking, strict penance and wide and deep reading, the boy, grew up to become Brahmasree Vishnubharatheeya Swami and to be the representative of Vishnumaya. The Chief today offers solace and shows the right path to the devotees who come here irrespective of whether they are learned or illiterate, rich or poor. 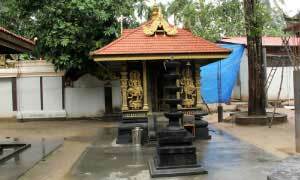 There is the sacred presence of the Navagrahas in the temple of Vishnumaya. The fact that at the time of consecration there was the auspicious sight of the Kite (Krishna Parunthu) in the sky, going round the place thrice, points to the presence of the Lord of Thriprayar also.It is not a small matter that for the last thirty six years, through the divine radiance that is in him, Vishnubharatheeya Swami has been able to offer guidance to the thousands of helpless devotees who approach him for Chathan Swami’s blessings. 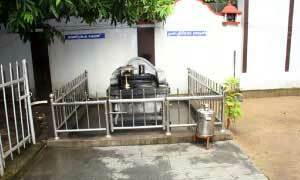 For many years, the temple has been offering Annadanam, the most auspicious among all alms, every day. Kanadi Kavu has always been in the fore front in using the money received from the devotees at the temple for improving the well being of devotees and facilities available to the people who come there. This fact is vouchsafed by the people who have experienced it. There have been countless devotees who have come to the Kanadi Kavu to submit before the Kuttichathan their difficulties and listen to the pronouncements, over the years. They perform the rituals as per the pronouncements and receive from Swami the sanctified Mudra (Prasadam), Karushakti, Upadesamanthram and Elassu (talisman). They have all been relieved of the difficulties caused by the evil spirits and living happily with all prosperity.The number of people who arrive here seeking a remedy for the difficulties in their lives and those who come to offer their thanks for the favours they have received from here, are ever on the increase. Devotees are assured of relief from the troubles that arise out of the displeasure of Chathan Swami, the troubles that are caused by the evil rituals that have been performed against them by enemies and those who are envious of them, the evil effects caused by the changing position of the nine planets, difficulties in getting a good marriage due to the unfavourable position of the planets at birth and infertility caused by the evil effect of Yakshi, Kinnara or Gandharva. 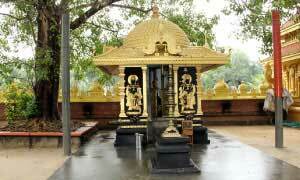 Poojas according to the pronouncement should be conducted faithfully in the temple. The special message of Brahmasree Vishnubharatheeya Swami is “Worship God, Love Nature” as the one way for mankind to escape from the complete destruction that is threatening the world. He is moving forward with the slogan “Let the World Win” for the upliftment of all, irrespective of caste and creed. Sri. C.H. Kunjappa, former editor of the Mathrubhumi Daily, in his autobiography, “Smaranakal Mathram”, has described the supernatural powers of Sree Kuttichathan. Most of the incidents have been taken from his own personal experience. The sub deities here are Bhadrakali, Bhuvanaeswari, Kukshikalpam and 390 Kuttichathans, Nagaraja , Nagayakshi and Brahmarakshas as a couple. Thottampaatu for Bhadrakaali is performed on the seventh day after Thira Vellattu. Sarpakalam for the Nagas is performed in the month of Vrischikam. The main offerings made by the devotees include Roopakalam, Chuttuvilakku, Niramala, Brahmavellattu Karmam, Veethu, Guruti and Pushpanjali.